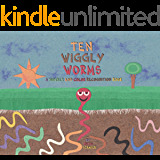 Count along as ten wiggly worms wriggle up onto the world. What will they discover? Can you count them all? What colors are they? Join them and have fun learning in their wiggly adventure! From the same author of 'Logan And The Magic Fish' and 'Salem The Safety Seal'.